In his rollicking, insightful new book Season of the Witch: How the Occult Saved Rock and Roll, author Peter Bebergal delves deep into the weird connections between popular music and the occult, and how the former has so often utilized the mystique of the latter. In this excerpt, Bebergal looks at the rumors that have long circulated about Jay Z’s involvement with the mysterious Illuminati cabal, and what those rumors signify about how we think of the rap superstar. 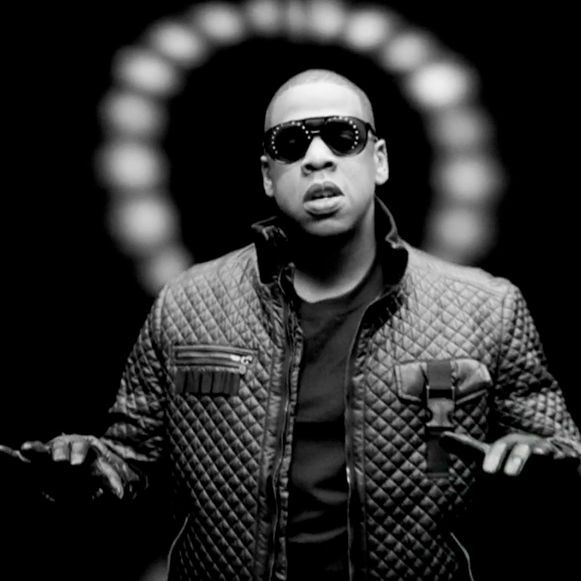 The video for Jay Z’s 2009 single “On to the Next One” is a masterpiece of symbolism. Jay Z stands in the center of the frame, haloed by a circle of dim lights behind him. Throughout the video, frame after frame of flashing images, is a well-dressed man in skull-like makeup reminiscent of the Joker; a white-gowned ninja battling the air with batons; a jewel-studded skull; smoke swirling into Rorschach test patterns; a crucifix; thick red lips dripping blood; and goat skulls with massive horns. Jay Z’s raps are fairly standard as far as hip-hop goes. It’s a self-referential narrative of success, of moving forward, not looking back, embracing his riches, and a warning that his fame and creative output are only going to get greater. But pay closer attention, as certain fans indicate in the YouTube community, and you might see that some of these gestures and images that make up his persona point to the hidden secret of Jay Z’s success. It can’t be talent alone — no black man in America could make it as big as Jay Z without help from “the inside.” Underlying the truth is that Jay Z sold his soul to the devil — seen clearly in those horns that flash during the video. But this is not any devil. This is Baphomet, believed by some to be the hidden god of the Freemasons revealed during the 33rd degree ritual, who paves the way for the initiate to become part of an even greater fraternity known as the Illuminati. Jay Z raps that he is in control of his own destiny but, studied from another angle, he might be merely a pawn in a sinister game of control. If you want to find common ground between the extreme far left and the extreme far right, conspiracy theories about the Illuminati will bring even the most hated enemies together. The enemy of my enemy is my friend, as it were. While there may be disagreements over who controls what — and to what degree Jews are involved — there is a basic outline that is generally accepted. But first we have to highlight what conspiracy theorists might see as pesky facts. A quick look back: In 1776, a Bavarian law professor by the name of Adam Weishaupt gathered together like-minded men to form a society that would attempt to liberalize the spirit of society. Weishaupt had been educated by Jesuits but grew distrustful of a church that constantly seemed to abandon reason for superstition. He called his group the Order of the Illuminati to highlight that they believed in enlightenment — albeit through reason — for humanity. Weishaupt’s attack on religion was sure to run afoul of the royalty whose ties to the Catholic Church were stronger than the abstract ideas of humanism and freedom. Weishaupt made matters worse for himself when he joined the Freemasons and tried to align his idea with theirs. Freemasonry was too heavily invested in its own spiritual symbolism and Rosicrucian-influenced rituals for Weishaupt to make much of an impact, though. His political views were seen as anarchic by the authorities, and he was ordered to disband his order or face the death penalty. Weishaupt complied, the society dissolved in 1787, and the once enlightened freethinker died in 1830 a devout Catholic. Weishaupt’s criticism of the Church, coupled with his group’s relationship to Freemasonry, led Freemasons’ critics to contend that the fraternity was in league with the devil. They would declare that Freemasonry purports to believe in God, whom Freemasons call the Great Architect, but this was just for appearance’s sake. Over time, the Illuminati movement has become a blank slate, capable of representing whatever imagined nefarious, occult, or anti-Christian intrigue that needed a label to give it substance. More often, the Illuminati are believed to be the group that controls everything, using smaller organizations like the Freemasons, the Council on Foreign Relations, the Catholic Church, Scientology, and the entertainment industry — especially music — as tentacles of control, touching on every aspect of society. In 2013, the rapper Professor Griff (best known for his stint with the group Public Enemy, whose 1989 single, “Fight the Power,” became the anthem that closed out the 1980s) was interviewed by Coast to Coast AM, a syndicated radio show known for its emphasis on topics relating to the paranormal, pseudoscience, and conspiracy theories. Professor Griff (born Richard Griffin) explained how Jay Z, wittingly or unwittingly, is helping the Illuminati use hip-hop as a way to infiltrate the black community. Hip-hop’s original intention, Griff said, was to raise up the dispossessed, but Jay Z and other entertainers are subverting its purpose by using it as a weapon of control. Moreover, the record industry is complicit, allowing the Illuminati to stage rituals as the music is being produced, instilling it with demonic energy. At the other end of the spectrum, and whose gaze meets Jay Z in the middle, are the conspiracy theorists for whom music is a potentially dangerous weapon in the arsenal used to control the minds of youth and adults alike. For those who are Christian, the architect behind the hip-hop Illuminati is Satan, who has been using pop music to subliminally convert the masses since Elvis first shimmied his hips. On Judgment Day, people will wake up and see that they have been duped. But it will be too late. They had unwittingly sold their souls during the 666th time they listened to one of Jay Z’s songs. This was the kind of thinking that led to the building of a case against the West Memphis Three. The occult imagination had come too far, though. It was too much a part of rock and roll’s essence to ever be quieted by fear and delusion. And if a musician is still accused of being in league with some secret occult cabal, all the better. The tools of the magician to mystify are the most powerful of all. If your musical spell has convinced your audience that you are more than you appear to be, you are simply continuing rock’s legacy of glamour, of weaving an enchantment that rattles the habitual souls of the masses. Copyright © 2014 by Peter Bebergal from the book SEASON OF THE WITCH: How the Occult Saved Rock and Roll published by Tarcher, a division of Penguin Random House. Printed by permission.